Originally published in the Cherwell. 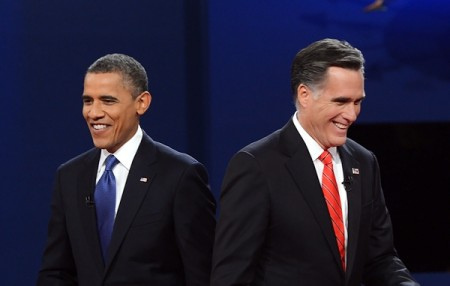 After eighteen months of campaigning, Americans vote in earnest in Tuesday’s presidential election, with opinion polls suggesting a tight race between incumbent President Barack Obama and former Massachusetts Governor Mitt Romney. For those planning on staying up to watch it, the crucial questions are: at what point will the identity of the next president be discernible, and when will we know for sure? The short answers are, respectively: pretty late, and later still. With the 48 contiguous states spanning four time zones, American elections have no 10 p.m. Big Ben moment when voting closes and the exit polls are released. Instead, the night will play out with a series of projections on a state-by-state basis. Each state has a set number of votes to award to a candidate in the ‘Electoral College’, and all but two award their votes on a winner-takes-all basis. Predicting when results will emerge, let alone what those results will be, is a risky business. The TV networks have likely learned their lesson from the debacle in 2000, when Florida was called for both candidates at various points during the night, so will tend to hold fire on projecting a winner until a state’s polls are all closed and a result is clear. Midnight: The first polls close. It will actually be Wednesday before we know anything at all. 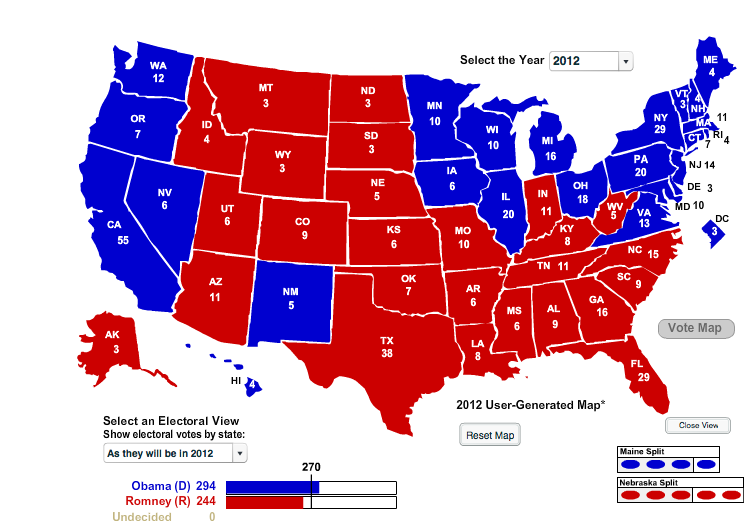 Both candidates should get off the mark straight away, though with the bulk of these states going to Romney. The big state to watch for here is Virginia – one of three large swing states Romney realistically needs to take the White House. A quick call for either candidate in the state would be surprising and very indicative of strength nationwide. Failing that, listen out for reports on ethnic minority turnout: the higher the better for Obama. 0030: Ballots close in the ‘tipping point’ state. Ohio’s 18 electoral votes have a good chance of proving decisive this year. The president has maintained a small but stubborn lead in the state, which if replicated should ultimately be enough for a second term. North Carolina closes now too – a quick declaration for Romney there would suggest he is in a healthy position nationwide. 0100: 17 more states put on the map. By this point, 270 electoral votes will be in the mix – exactly the number needed to guarantee victory. Of course, neither candidate will be anywhere near that number by this point, but both men’s totals will be rising. New Hampshire, Pennsylvania and especially Florida are the critical states here. 0200: Will Obama make it in the Midwest? At 2am the polls close in a pair of states Obama would like to sew up quickly: Michigan and Wisconsin, two chunks of the president’s Midwestern stronghold. The most plausible way the night could end ‘quickly’ from here is if Obama has Ohio already (a big if) and Michigan and Wisconsin follow suit. Anything else and it’s Red Bull time. 0300: The final pieces of the puzzle? Even if Obama plays well in the Midwest, he’ll likely still need one or two of these late states to take him over the line, assuming he hasn’t taken Virginia or Florida already. The most likely of these are Nevada and Iowa, but just one would suffice if the President has the Midwest locked up. 0400: Final result possible. By now, the arithmetic should be becoming clearer, even if your vision is not. This is when results come in from California and the Pacific Northwest, no doubt giving the incumbent a big mathematical boost. So by this point, either Romney will have run the map in Ohio, Florida and Virginia as well as a host of smaller swing states, or Obama will be expecting a concession call from his rival imminently. Of course, the dreaded third possibility here is that Ohio and/or Florida are still “too close to call” and no-one is close to 270; it could then be hours – or, with recounts, even days – until the winner is known for certain. Clearly it’s difficult to predict anything about this election with total confidence – except for the obvious fact that November 6th will be a very exciting and important night.